It’s not as bad as Internet Explorer asking you if you trust content from the publisher “Microsoft”. This is very annoying. TM Internet Security reports the same thing. 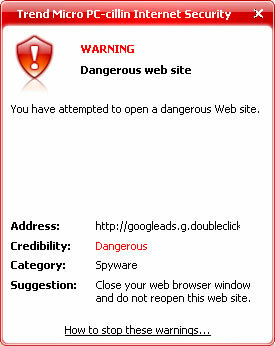 I am tempted to add googleads.g.doubleclick.net to my trusted list just to stop the constant alerts. What are you planning to do? So, instead, I took the issue up with Trend Support. They’ve asked me for the usual truck load of logs and dumps, which I submitted yesterday. I’ll post an update here once they resolved the issue. Thanks for taking the lead in resolving this annoying problem. Hopefully TM post an update soon. I will be patient. The alerts have stopped on my PC. What about yours? Refer update above (problem still remains). Updated and solved. See “Resolved” in main post above.